I have none of my meteor pictures handy to post, but I'd hate for anyone to miss the show. The annual Perseid Meteor Shower peaks Sunday night/Monday morning and we're favored this year by a new moon. 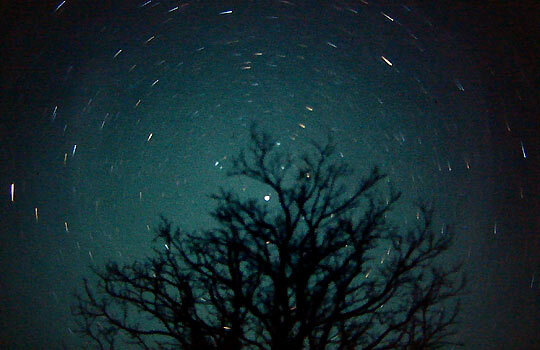 There's a good chance of seeing more than the usual amount of meteors tonight (Saturday) and early Sunday morning too. Read more at this NASA page. Grab a blanket or a lounge chair...better yet grab several and some friends and go outside! It's cooler at night, you know. The area in the center that seems not to move (of course, everything is moving, but that's another story) is Polaris, the North Star. These were done on Ektachrome 200; I'd love to see what a good digital could do these days. 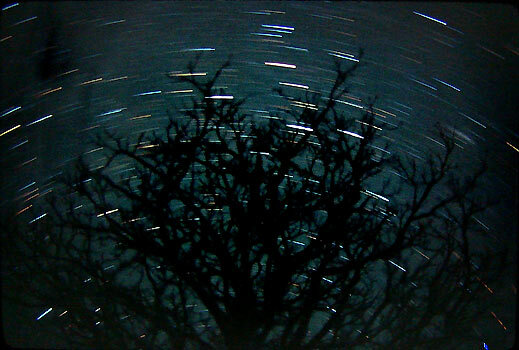 Because you have to focus at infinity for the stars and meteors, any ground object you use in the shot, like this tree, may be out of focus a bit. It's a trade-off, as are most things in photography: a narrower aperture will get you more depth of field and a sharper foreground...but will decrease the chances of getting the less-bright parts of a meteor tail.